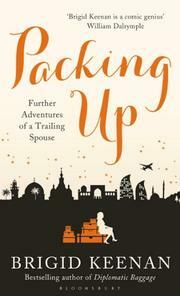 A British memoirist continues the engaging story she began in her best-selling book, Diplomatic Baggage (2005), about her late-midlife experiences as the wife of a career diplomat. When the peripatetic Keenan and her husband, AW, returned to Europe from Kazakhstan, each felt like “a lost sock in the laundromat of life.” As AW trekked back and forth between his post in Brussels and the couple’s home in London awaiting word on what would be his next, and final, assignment abroad, the author learned that she had breast cancer. Meanwhile, their two grown daughters were entering new phases in their lives as wives and mothers. Between her surgery, planning for one daughter’s wedding and awaiting the arrival of another’s baby, Keenan felt like “a maypole with [her] ribbons being tugged by [her] family in all directions.” But she survived the changes and learned to cherish the grandchildren who had first seemed like “interruptions to normal life.” Her husband’s new posting to Azerbaijan—a beautiful but ruined country where “the word for ‘corruption’ and ‘gratitude’ [were] the same”—brought new challenges. There, she coped with the occasional pangs of jealousy over AW’s gorgeous young assistants and frequent but amused frustrations with a Russian housekeeper who seemed determined to drive Keenan mad with her bizarre antics. A holiday at a Sri Lankan spa intended to restore peace and health turned into an unintended ordeal that left the author even more frazzled than when she started. Even retirement seemed an adventure—until she began to realize the implications it had for her and her husband’s identities and daily routines. It was then that she realized her life hadn’t been so much about seeing the world as about the inner journeys those travels had set her upon. Intimate, funny and keenly observed.